Health care institutions and the communities they serve are intimately interconnected, especially during and following extreme weather events and human-made disasters. 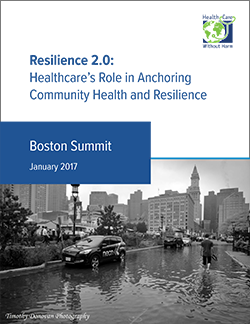 In January, 2017, Health Care Without Harm convened a Summit "Resilience 2.0: Healthcare’s Role in Anchoring Community Health and Resilience" focused on leveraging community health and climate resilience as a key strategy in the strengthening the health care sector’s climate preparedness. Outputs address 1) health care sector engagement in climate public policy; 2) a business case for climate resilient health care; 3) innovative solutions to backup and reliable power generation for health care facilities and community providers; and 4) creating robust networks of partnerships. The lessons learned, questions raised and next steps are relevant to many places. Metro Boston hospitals have made significant energy reduction and GHG progress. New analysis and a report completed in May, 2017 shows they cut their energy's greenhouse gas emissions by 29 percent between 2011 and 2015, are on track to reduce emissions 33 percent by 2020, and 47% by 2020 compared to "business as usual" energy growth of 1.5% per year. The 47 percent reduction is the equivalent to eliminating the annual greenhouse gas emissions of 42,220 passenger vehicles. Health Care Without Harm hired its very first paid staff in Boston in 1996 to launch its medical waste incineration and medical mercury elimination campaigns. Ever since, HCWH Boston has continued to create and lead some of HCWH’s most ambitious efforts, including toxics reduction, green building, cleaner energy, and environmental health community benefits. Many of these efforts have spread around the country and the world. Health care institutions and the communities they serve are intimately interconnected. At no time is this connection more critical than during and after extreme weather events, from heat waves to flooding, droughts to blizzards. In the city of Boston, public policy makers and health care institutions are focusing on improving health care’s resilience to climate change impacts, with an emphasis on anchoring community health and resilience. Health care is the largest single segment of the Boston economy. Taken together, health care and university education account for more than 20 percent of local employment. In addition, hospitals are critical infrastructure: Their uninterrupted operation during and after extreme weather events is crucial to providing essential medical services. At the same time, health care is uniquely positioned to not only deliver clinical care, but also influence the health and resilience of the communities in which it is situated. The Summit was convened by Health Care Without Harm, made possible in part by sponsorship support from the Barr Foundation and co-hosted by Partners HealthCare to catalyze climate action planning for metro Boston health care service providers and allied stakeholders in the communities they serve. In addition to providing updates on the interconnected climate resiliency initiatives happening within the greater Boston area, the summit fostered a new dialogue about the role of the health sector in anchoring community health and resilience. It also created a network of organizations and champions who recognize each other, know what each other does and can find ways to provide mutual, complementary support. The outcomes of the one-day event and compiled resources have been summarized in a report, available here. Our current work reduces energy use and greenhouse gas emissions, and advances climate preparedness by health care facilities in greater Boston and around the region. We do this primarily through our role as coordinators of the Health Care Work Group of the Boston Green Ribbon Commission (GRC). The GRC is a unique cross-sector collaboration of over 30 CEOs working to support Boston’s climate goal, which is to reduce greenhouse gas emissions by 25% by 2020, and 100% by 2050.
generated enough cost savings to pay for health care for 1,357 Massachusetts Medicare enrollees, equivalent to >$300 million in new patient revenue. A 20% hospital sector greenhouse gas emission reduction is coming from significant investments in low impact hydro, wind, and solar power by Partners HealthCare and Boston Medical Center (BMC). Partners is working to make its entire health care system net carbon positive for all energy by 2025, and BMC expects all its energy to be climate neutral by 2018. Resources and information on the GRC Health Care Working Groups’ remarkable progress, including a sample Energy Conservation Incentive Lease Agreement, a generic Strategic Energy Master Plan RFP, hospital CHP program information and more, are available here. Create a first-in-the-nation metro area health care energy and greenhouse gas data base, so HCWH can publicly report sector wide trending and usage. Years of energy data for 22 million square feet of metro Boston hospital space, including >24,000 records, has been uploaded into US EPA Portfolio Manager. A custom web interface helps track participants’ progress towards a 100% reduction in green house gas emissions by 2050. Collaborate in support of energy efficiency policy advances at the city and state level, including active engagement with forward-thinking utilities, state policy makers and others to make sure the health benefits of energy efficiency are properly valued, and to shape the Commonwealth’s utility energy efficiency programs in ways that enable health care facilities to make the deepest improvements possible. Similarly, we helped the City of Boston shape an innovative Energy Reporting and Disclosure Ordinance for all large commercial and multi-family buildings. For more information on HCWH’s work with the Boston Green Ribbon Commission, contact Bill Ravanesi, Senior Director of Health Care Green Building and Energy Program, or Paul Lipke, Senior Advisor, Energy and Building.